For the aviation enthusiast interested in local flying, the Recreational Pilot Permit is for you. After you receive your Recreational Pilot Permit, you are able to fly anywhere in Canada during daylight hours and you can take along 1 passenger. The Recreational Permit allows you to fly any aeroplane designed to be flown by one pilot with a seating capacity of up to 4. This includes most general aviation airplanes that you would see at a small municipal airport. Depending on how often you are able to fly, the Recreational Pilot Permit takes approximately 10 months to complete. It can be done in as little as one month, or if you like to take your time, a couple of years. There is no time limit to complete this permit and we will work around your schedule. On average, a student will do about 45 hours of flying to get their Recreational Permit, at an average cost around $13,000+HST. 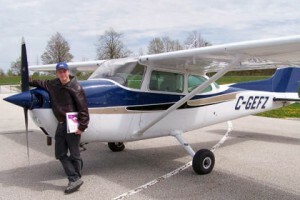 However, depending on a students personal abilities and how often they are able to fly, you may be able to get your Recreational Permit in as little as 25 hours (Transport Canada Minimum) however this takes great skill and dedication. There is no age limit to start training but you must be 14 years old to fly solo and 16 years old to receive the Recreational Permit. The ground school course we provide meets the standards of the Private Pilot Licence and therefore can be used later to upgrade your licence. The ground school course is 42 hours long, spread out over several weeks and includes topics such as air law, theory of flight, airframes, instruments, radio procedures, flight operations, licensing, meteorology, navigation, etc. For information give us a call at (519) 372-1259 and we will be more than happy to answer any questions you may have.